Only 27% of 16-year-olds on free school meals achieve A* to C grades at GCSE, compared with 54% of their peers. This suggests that the over one million children who are eligible for free school meals because their family income is £16,040 or less, are more likely to do worse at school. These children are also less likely to go into further education; in 2007, only 6% went on to do A-levels, and out of 80,000 15-year-olds who claimed free school meals in 2002, only 45 made it to Oxbridge. Westminster is particularly affected by child poverty, so it is no surprise that 34% of 19-year-olds in the borough lack level three academic qualifications, for example a-levels. In Westminster 40% of secondary school pupils receive free school meals. That is over twice the England average of 15% of pupils in all state secondary schools in 2011. There is a cycle in which poverty as a child leads to lower educational achievement and lower educational achievement then leads to poverty as an adult. However, children who receive positive early education are less likely to experience the negative impacts of having parents out of work. Problematically though, children in low-income families are less likely to receive an early education. It has been found that families are the most important factor in determining a child’s educational achievement, which suggests that it is crucial for families to have access to the support needed to help them improve their children’s education. This support will improve children’s’ educational attainment, and then go on to improve future employment opportunities and quality of life. This is why at Westminster Befriend a Family we offer practical help with schoolwork and problems at school, as well as supporting parents; to try and break this cycle so that no more children, or adults, have to live in poverty. In Westminster 71% of primary school pupils first language is not English, this is over four times the average in England. There is a clear agreement among education and linguistic experts that teaching in the language that children have used from birth, their mother tongue or first language, offers the best chance of educational success. This is why at Westminster Befriend a Family we offer children, and their parents, the chance to socialise in English through a range of weekly community-based sports, arts and educational projects. Evidence has been produced to indicate that where school language is not used in children’s daily lives, it can tip the balance towards total exclusion from learning; so we are aiming to help include English in their everyday lives so that every child can effectively make use of their right to an education and to end the poverty cycle. This begins to show the importance of breaking the poverty cycle and the shocking impact that education can have on children from disadvantaged families. 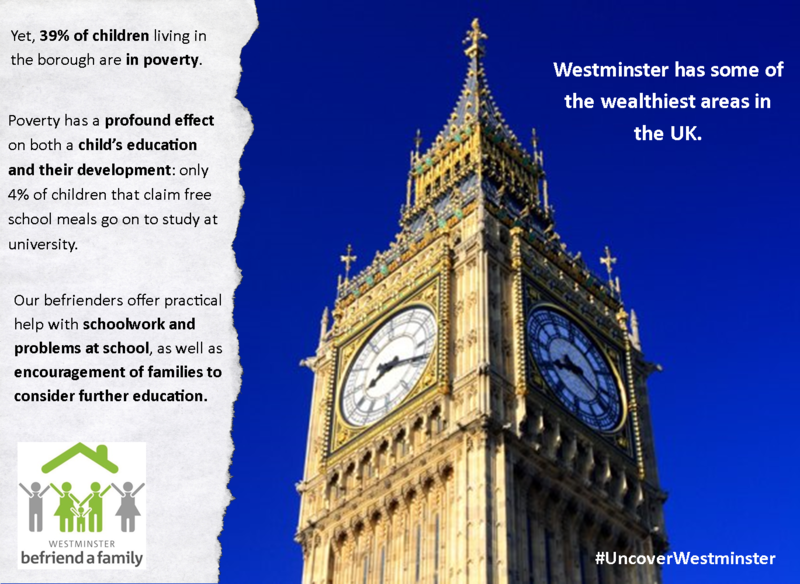 We need to #UncoverWestminster to raise awareness of these issues and to make sure every person, adult and child alike, has the chance to reach their full potential during their education through receiving a positive education experience and being provided with the support they need to achieve their goals. Poverty is not just about a lack of money but also about a lack of opportunity.